What you suggested should work. Another thing that could simplify your setup slightly is to simply create two different automated test runs, one where the proxy settings are set in a localsettings file and one where they are not set. Then you can use the -resource argument in each run to run only the tests that should be part of that test run. You wouldn't need to put the tests into separate workspaces, since the -resource argument lets you control which resources should be run. Thanks jakubiak. I do not see proxy settings as a property on the "localsettings" file when I "share" or export "All" the settings but proxy is not one of them. Is there somewhere else where this is set? I am using 9.10 version. 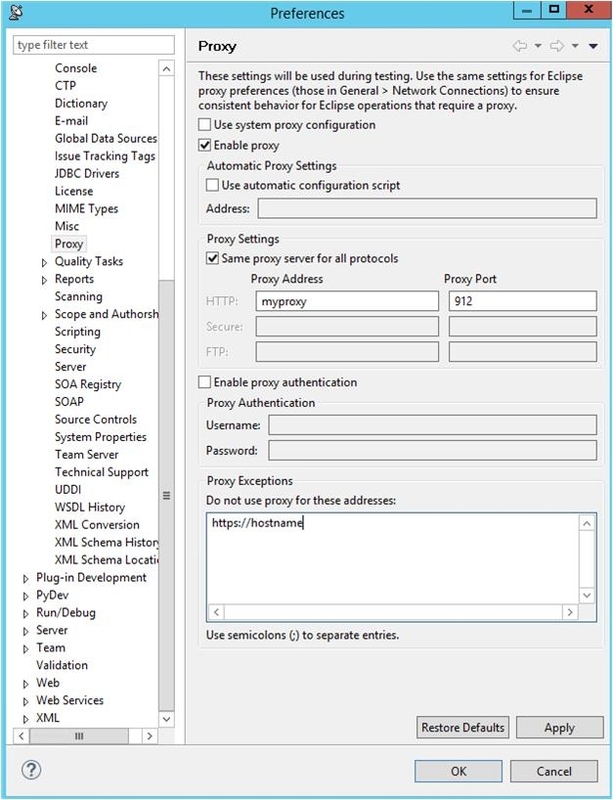 These proxy settings are part of your eclipse preferences which are stored within your workspace's .metadata folder. Specifically in the "com.parasoft.xtest.common.eclipse.core.web.prefs" file. You cannot apply those settings in the localsettings file - but you can copy that file into your workspace as part of your automated job. I had forgotten that the proxy settings could not be set in the localsettings file.